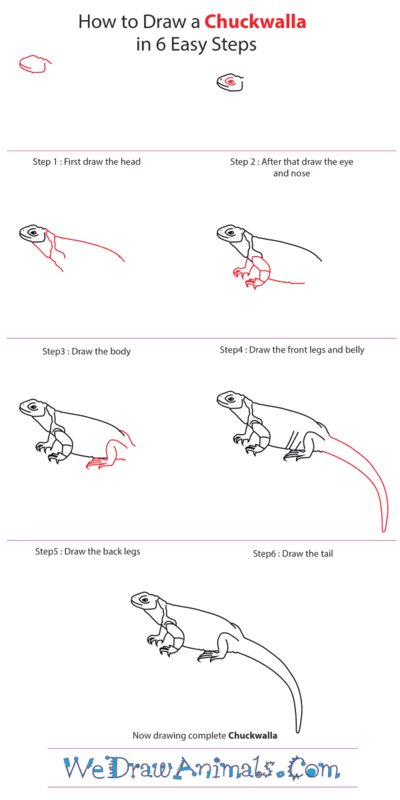 In this quick tutorial you'll learn how to draw a Chuckwalla in 6 easy steps - great for kids and novice artists. 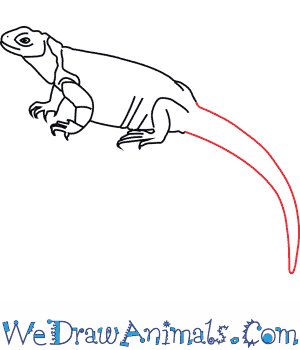 At the bottom you can read some interesting facts about the Chuckwalla. 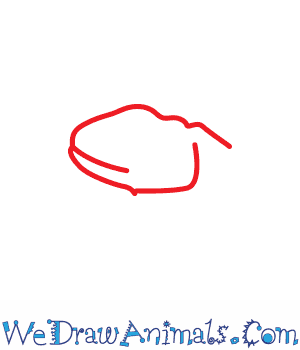 Step 1: Draw an egg shape on its side, with a bumpy upper part and a small line along the bottom. Step 2: Add a dot in the point of the egg, just above the lower line. 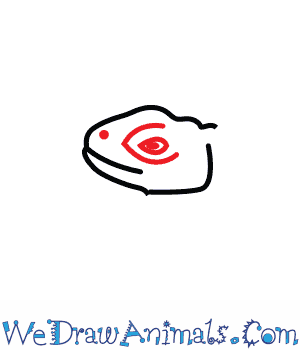 Draw a seed shape in the middle, inside a C-shape. Step 3: Draw a long curve down from the back of the head, and a straight line down from the front of the head. 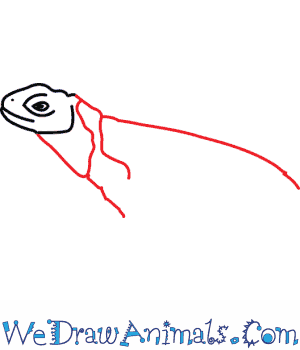 Draw two wavy lines that angle down from the top of the neck to the bottom. Step 4: Using the image to guide you, draw a long line under the neck that goes up, curves into the neck, back down, and turns into a sharp five-pointed shape. Add two horizontal lines on this shape. Above this first leg, draw a second on by just making the five-pointed shape that connects to the neck. Draw a curve next to the first leg. Step 5: Again using the image for help, draw a curve that goes up into the body, then down, meeting the belly, and then turns into a five-pointed shape, finally curving back inside itself. Draw a small curve over the end of the back. Step 6: Draw a long curve from each end of the body that meet at a point. Done! Chuckwallas are large lizards that live in the southern parts of California in the United States and the Baja Peninsula in Mexico. They live in dry and rocky deserts. They like to eat mostly local plants and sometimes a bug or two. A Chuckwallas measures to about 20 inches long and weighs 2 pounds. 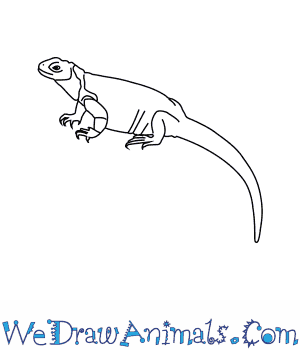 They are stout and scaly cousins to iguanas. 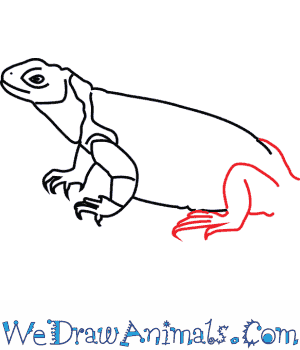 A scared Chuckwalla will run from danger. They hide in rocks and will puff themselves up so a predator can’t drag them out of their hiding place. There are 5 species of Chuckwallas. Chuckwallas are cold-blooded and like to warm themselves in the sun. This is a daily routine for them. Chuckwallas communicate by bobbing their heads to each other each movement means something different. 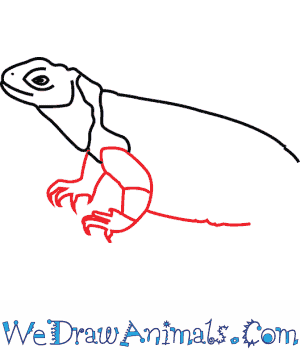 A Chuckwalla’s colors are often a shade of brown or red. Young Chuckwallas have stripes, especially around the tail. Males will lose those as they get older, but females do not. Chuckwallas sleep during winter months. They come out again in February. Females will lay about 6 eggs. Lesson Plan Note: Chuckwallas are just one of the things that make the Baja Peninsula a unique place. Take a week to introduce your class to the diversity of northern Mexico and the American Southwest.